Marianne via her East of Malaga’s CBBH Photo Challenge: Food asks “Is there a food typical of your country or area where you live? we eat better when we’re here than we do in Sydney. why is that, because you are the master barbequer? no, because we have time. We eat what we want and when we want. Preceding the drive out to our house we do a fresh food shop to supplement existing pantry ingredients, which are somewhat heterogeneous having been sourced at various places and times often on impulse and then forgotten for months in our absence. As we’d flown up for a 3 day mini-break and travelled light, not having much to unpack on the Saturday afternoon I made a quick cake (butter, sugar, eggs, vanilla essence, milk and flour) with swirls of just past its use-by-date home-made guava jelly I’d impetously purchased at the local markets the summer before last; and the G.O.’s favourite potato bake. We dined on that, the G.O.’s master barbequer delights, veges, fruit, eggs, toast, cheese and leftovers for the duration. For our last night I’d marinated pork belly strips with the remainder of the guava jelly, soy sauce and white condiment (vinegar). The G.O. despite my contrary advice couldn’t resist swiping them with a little extra marinade on the BBQ so they were fashionably ‘blackened’. Notwithstanding their deliciousness we couldn’t eat them all, or take them on the plane home, so leftovers were dropped off to the M.I.L. whose affection for potato bake rivals the G.O.’s. My own theory why we perceivably eat better at Taylors Arm is that barbeque and potato bake are native to our TA diet, i.e. not something we partake of at our Sydney apartment. 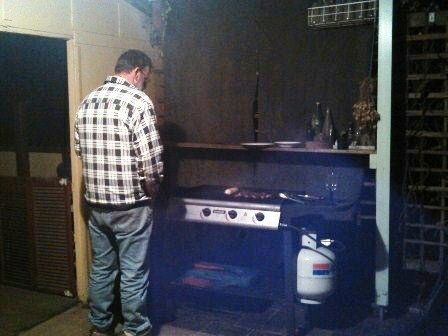 We gave up trying to barbeque on our noisy, grimy city apartment balcony – it’s just not pleasant or worth the effort. The G.O. never requests potato bake in Sydney (although he notes when we bring leftovers back) and I deliberately don’t make it, to maintain the holiday mystique. Slice a few potatoes and onions thinly. Layer potato then onions in a buttered casserole dish drizzling pure cream and grinding salt & white pepper over each layer to taste. Cover with lid/foil and bake in a 200 C (392 F) oven for about an hour until soft then sprinkle with grated cheese of choice and bake without lid/foil until cheese is golden. Wonderful the next day as a base for frittata – warm leftovers in a non-stick frypan with, if you choose, anything interesting you have to hand, top with beaten eggs and put under the grill or in the oven to brown. To join in the CBBH Photo Challenge all you have to do is post your entry by the end of the month, tag your entry ‘CBBH Photo Challenge’, link back to the East of Malaga blog and, most importantly, don’t forget to add links to any two blogs that you’ve commented on during the past month, so that we can all HOP OVER and have a look. talltalesfromchiconia – “living in tropical Mackay QLD; gardener and vegie grower; quilt maker; enjoyer of expensive book and fabric stash habits; gluten free cook”. Veronica Roth – “takes photos every day, takes herself out on art dates, takes sugar with her tea, loves papers and pencils and oils and brushes and quills and inks and poetry and sushi, loves her cars and computers and canons”. 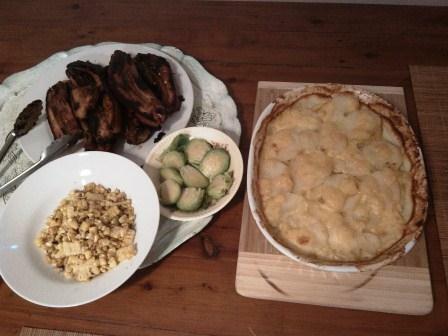 This entry was posted in Blog and tagged Australia, CBBH Photo Challenge, cooking, food, my life.